So you want to know how to create 360 degree videos? Let us help you with that. We're writing up a series of articles about setting up a 360 camera rig, filming, editing, publishing and distribution. This article will focus on the equipment you'll need and setting up the 360 camera rig. Nowadays there are a lot of options when it comes to 360 cameras and stitching software. I'll be explaining our 360 degree filming journey with the Freedom360 mount, GoPro HERO 4's and Kolor Autopano Video Pro. Feel free to try all the other options. We bought our Freedom360 mounts, six GoPro HERO 4's and stitching software through the Kolor Store which only took a speedy four days for the payment to clear along with delivery to our door. Highly recommended company. We sourced Kingston 64GB memory microSDHC/SDXC UHS-I U3 90R/80W cards from a UK website. For us the 80mb/s write speed ensured that we'll have the capabilities to record higher data rates as new frame rates and resolutions come available. Lastly, a Monopod, Tripod or something that will hold the 360 camera rig in place. This differs depending on each situation so we'll follow up with a detailed blog post about mounts. The Freedom360 mount includes all these items in the package. With all that equipment you can begin filming 360 degree videos. To start, you need to setup all the GoPros in the Freedom360 mount. This is what the Freedom360 mount looks like without GoPros attached. Before we bought the mount we couldn't find any photos of it without GoPros. Freedom360's marketing team probably didn't think people would pay a lot for a blank shell. Showing pictures of your mount being used with GoPros makes it all more desirable. 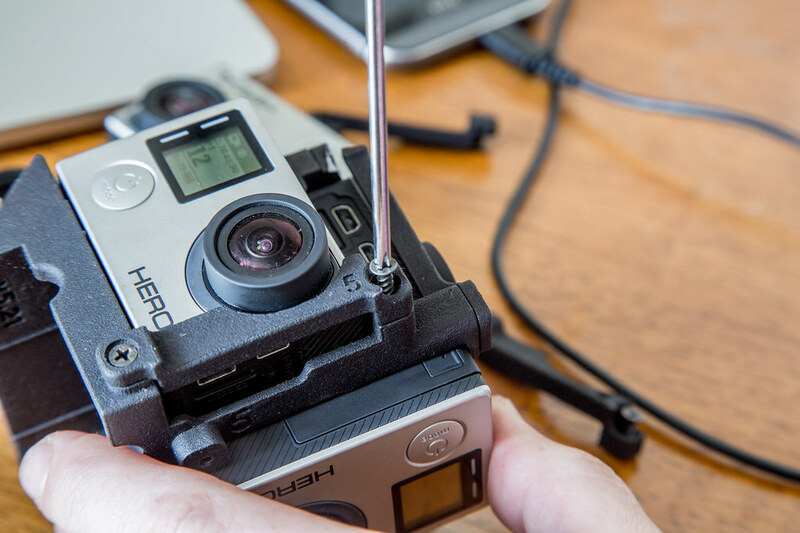 Start by attaching the clip end of the GoPro to a slot in the Freedom360. Screw all the braces to the Freedom360 to secure the GoPros in place. Keep going. Screw all six GoPros. The package comes with a 3/8 male connector. The Freedom360 mount has a female connector on it. I think you know where this is going. To connect the camera rig to monopods and tripods you need that little connecter screw attached between the two. Twist the 3/8 screw halfway into the Freedom360 mount. The other end screws into whatever attachment you need to hold the camera rig. Note: The Freedom360 Explorer mount comes with the 4mm Allen hex wrench pictured below. No matter how careful you are something will inevitably go wrong. When you're on the move place the 360 camera rig in the ThinkTank protective carry case. This is included with the Freedom360 mount. It will stop lens abrasion, fend off dirt, dust and adds a cushion around the rig. Now you're ready to take on the world. That's are setup. More posts about video settings, filming, editing and much more to come. If you found value in this article and know someone who would be interested in it. Share it with them. Follow us for more great articles on Twitter @360thrill.